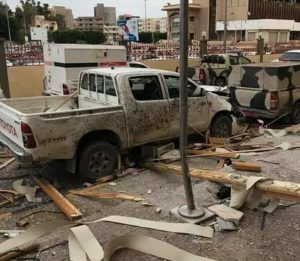 A major attack on the court buildings in Misrata this morning is reported to have killed four people and seriously injured 15. At least a further 25 are said to have been wounded in what appears to have been a coordinated assault for which the so-called Islamic State (IS) has claimed responsibility. The court was in session when it was attacked around 11.30 am by three men who started shooting.It was initially suggested that the assault may have been an attempt to free IS members who were on trial. However, the mayor of Misrata, Mohamed Eshtewi, has said that no IS trial was taking place. According to a court employee, he and his colleagues were told that they were being attacked by IS and were given guns to defend themselves. The shootout lasted for over half an hour during which the judicial police and support units that arrived to help them managed to kill one of the attackers. One of the others then blew himself up on the second floor. Video footage shows the second floor windows being blown out. The third terrorist then blew himself up on the ground floor. Reports of a car bomb outside the court were not true. Defence ministry and formerly Bunyan Marsous spokesman Mohamed al-Ghasri has said that the attack targeted the head of the court, Assadik Badi, saying it was in revenge for statements he had made about IS. Misrata Central Hospital put out an appeal to staff to come in and help deal with the wounded. Misrata suffered a number of suicide bombings in 2015 and last year. But despite fears that IS cells would revert to to the tactic after their defeat by Misrata-led forces in Sirte, there have been no attacks – until now. Condemnation of the attack, and condolences for those killed has been coming from all quarters in Libya, including from Khalifa Hafter. Three of the dead have been named as police officers Mohamed Al-Naali, Abdussalam Abuali and Mohamed Jibril.